This is our favorite salad using Indigo Rose OP Tomato, our new introduction for 2012. We had it nearly every day last summer and eagerly look forward to enjoying it again. Other small salad tomatoes can also be used but to my mind none are as beautiful as Indigo Rose in this delicious combination of taste and color. The deep purple exterior is rich in anti-oxidant anthocyanins and the interior of these 2” fruits is a rich bright red. The flavor is bright, tart and pleasant. It is important to mention, Indigo Rose, the world’s first high anthocyanin tomato is a result of traditional breeding and selection over many years and not a result of genetic engineering. Bred at Oregon State University by Dr. Jim Myers, it is the result of growing out the best selections over more than a decade selecting for performance, coloration, and flavor. it is open-pollinated. We are pleased to introduce this fine and unusual selection in 2012. We start our tomatoes from April 1 to April 15th and transplant around Memorial Day weekend. 10-12 Indigo Rose Tomatoes (weight about 1.5 to 2 lbs. Directions: Cut each tomato into quarters. Gently combine tomatoes, onion, vinegar, oil, salt and parsley. 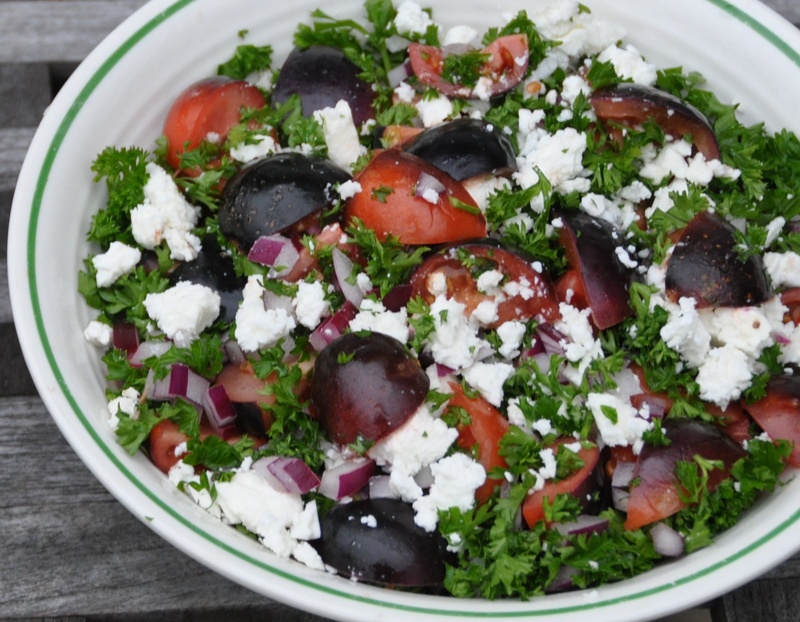 Place in bowl and sprinkle with coarsely crumbled feta cheese. This salad is also very good with one or two tablespoons of chopped basil. Serve, this can be easily doubled and serves 3 to 8 depending on whether this is a dinner salad, with bread, or simply salad. We’ve been enjoying this all week and it is one of those recipe that varies not in a bad way but cilantro doesn’t always taste quite the same. Nevertheless, this began as a dip for carrots. Since then it’s been part of a salsa omelet, a dip for chips and added to burritos. Directions: all these ingredients will be chopped and placed in blender or food processor. Rinse cilantro and trim off stems, coarsely chop garlic, trim onions leaving 3-4″ green tips, cut peppers in half and remove seeds and pithy cavity lining. Place all ingredients in blender and puree until smooth. You may wish to add peppers one by one since they vary in heat. Add a little less salt than you think necessary and allow mixture to sit in blender for 30 minutes. Add more jalapeno, salt as needed and even additional lime or lemon juice if you want additional tartness. Puree again and serve or store until needed. 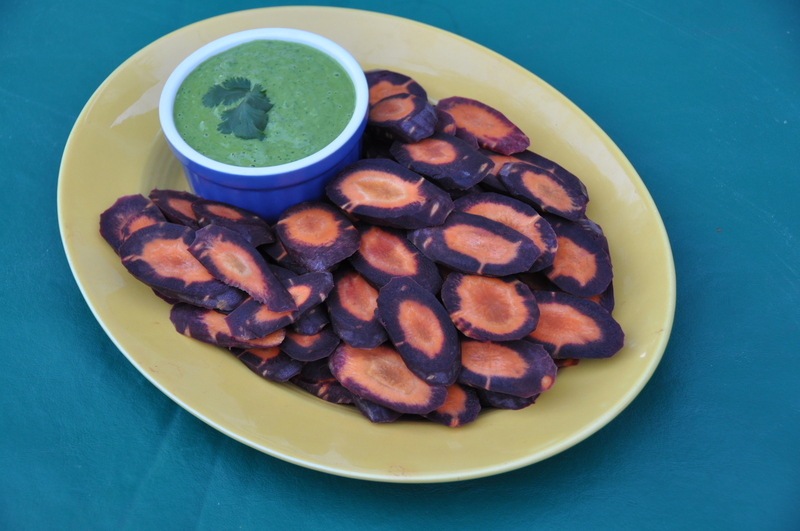 Our Purple Haze Hybrid carrots are shown on the plate with the Cilantro Dip. Cut the carrots on a sharp diagonal and they make great chips for dipping. These carrots are easy to grow with stunning delicious results. Cilantro can be sown every three weeks for a steady supply. Papaloquelite is a good summer substitute for cilantro which bolts in hot weather. Slices of Yacon should be delicious with this dip. 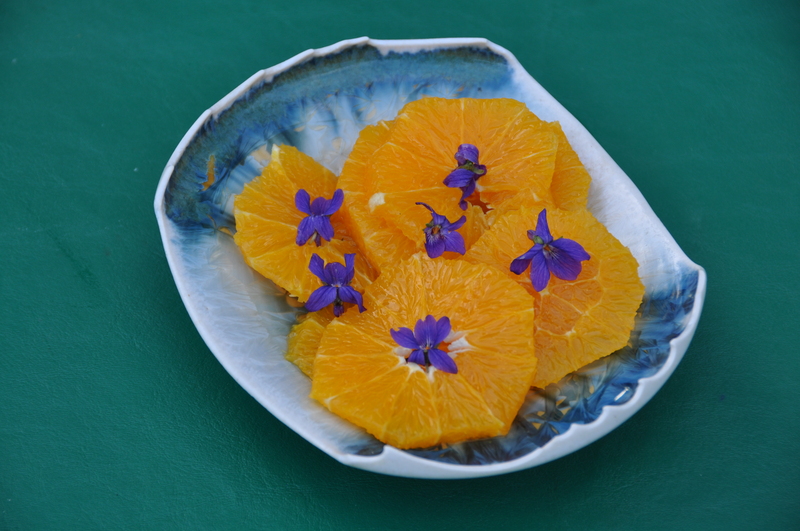 Spring violets, Viola odorata, are edible flowers with a color and fragrance that compliments fresh naval oranges when both are at their peak. Peel or cut away the orange rind, leaving as little pith as possible. Cut into 1/3” inch slices. Allow one orange per person and place on individual serving dishes. Drizzle with 1/2 tsp. mild honey. Garnish with spring violets or candied violets. This light dessert is the perfect conclusion to a winter meal. A few drops of orange liquor can be sprinkled over the oranges. Some gardeners dislike wild violets in their yards but we enjoy the fragrance and appeal of wild violets. Their scent seems to come and go because our scent receptors become exhausted and must have a few minutes to revive before we can again enjoy this definitive fragrance. 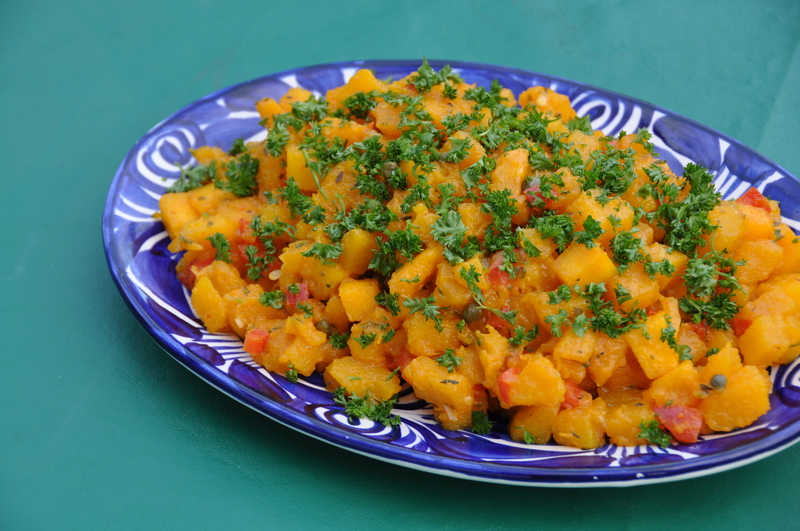 I‘m always looking for easy ways to use our crops of winter squash and have adapted this unusual recipe found in “Cooking From An Italian Garden by Scaravelli & Cohen. A cooked salad from winter squash struck me as novel and I wasn’t disappointed. The squash in the photo is Sibley Select, a sweet thick-fleshed Cucurbita maxima. Other varieties of winter squash are also suitable and find them preferable to pumpkin. Winter squash 2-2.5 lb. piece, deseeded. Allow lightly roasted squash to cool. Remove rind and cut into ½ inch cubes. Add chopped bell pepper and onions and combine with squash mixture.Add dressing and mix. Cover and marinate for at least one hour, or preferably overnight. When ready to serve add salt to taste and sprinkle with 2-3 Tbsp.chopped fresh parsley. Serve at room temperature. The flavor of garlic and hot pepper can intensify overnight. To correct add more chopped bell pepper or ½ cup chopped celery. This keeps for three to four days and is quickly transformed into soup with a 13 oz. can of coconut milk and ½ cup water. Blend until smooth. Place all in a medium size saucepan and simmer for ten minutes. Serve garnished with a sprinkle of cilantro.